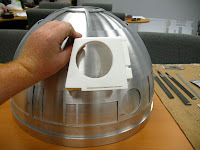 Steve's R2-D2 Building Blog: Mmmm...shiny! 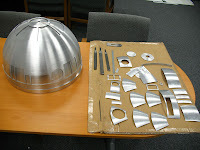 Work on the dome is under full swing. Removed all the panels from the outer dome and cleaned them up. Here are all the pieces removed. The tabs and slag have been sanded off. 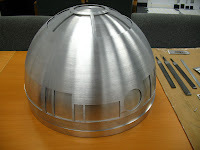 A close-up on the inner and outer dome. The outer dome still has a bit of slag that needs to be sanded off so it is sitting a little high on the outer dome. And just for fun, here is the resin eye held up.